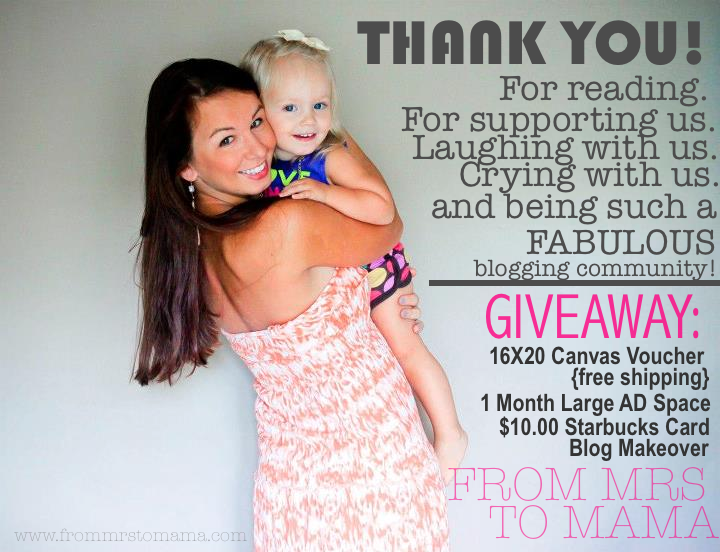 From Mrs. to Mama: $200.00 valued giveaway ;Canvas, blog makeover, ad space, and starbucks card! $200.00 valued giveaway ;Canvas, blog makeover, ad space, and starbucks card! I know I promised a giveaway once I hit the 2,000 GFC number, and since reaching that a few days ago, I was finally able to whip this up to share with all of my wonderful readers! A little about the giveaway: These are all items provided by myself. A canvas voucher valued at $120.00. 1 month large AD space on my website valued at $40.00, Starbucks GC for $10.00, and a BLOG makeover which there really isn't a price to it but lets just say $30.00 to make numbers add up! All of this will go to ONE winner. If the winner has their blog made over already and would love to graciously offer it to the next person, that option is also available! Because after all, its the community of sharing, right! So? Giveaway valued at $200.00! Thank you again, to everyone, for being so supportive and kind throughout my blogging journey. It has been an absolute wonderful experience. Winner will be announced next Thursday! I've been reading your blog for a few months--I think I first found you through a vlog linkup? My favorite part about blogging is definitely the friendships. I've met AMAZING girls who are now some of my best friends, and I'm so grateful for that! I've been reading for a few weeks now! My favorite part about blogging is connecting with people from all walks of life & learning new things! Love, love, love your blog! Every story you tell I'm always LOL!! Can't remember how long I've been reading. For a while now though! My favorite part about blogging is reading people's stories, suggestions, lessons. I've learned a lot! I've been reading for at least six months! My favorite part about blogging is getting to "meet" fun, new people that I would never usually get the chance to meet without the blogging community! I just started reading your blog this summer. I love the connection with other bloggers and finding people so similar to myself. I found your blog last week when someone tweeted you congrats on finding out it was a boy! So glad I did! I've been following you for close to a year! I love that blogging documents whatever you want! I've been reading for about a year and I love the support and friendships we get from blogging! what a generous giveaway. I've been following you on Twitter for a while now, but I am SO excited to be following your darling blog, Facebook and Pinterest accounts now! I have been reading for a few months. I love blogging because you get to meet creative and fun people! I have been reading your blog for at least a year I would say and I love hearing about your growing family and sweet Elliana!!! I've been reading your blog for over a year! My favorite part about blogging is learning about other people! I love reading your blog everyday! Your family is absolutely adorable and I honestly think you should be an inspiration to all mamas out there! Ahhh what an awesome Giveaway! I just posted about it ;) I think I've been following you since around Christmastime last year?? Congrats again on 2,000!! I've been reading since your Valentine's link up this year. I am loving watching your little family grow! I've been reading for probably a couple years?! My fave part about blogging is preserving memories for my family. I've been reading since you were the other blog name. Before you were even pregnant with E, funny huh? My favorite part about blogging is feeling like we actually know these people....and knowing some of them in real life eventually. I have been reading your blog for about 3 months, but when I start to follow a blog I go alllll the way back to the beginning to catch up! I've been reading for a few months now and really appreciate your honesty about life and being a mom. Though I don't have kids, it's refreshing to read from the viewpoint of someone who keeps it real. Just found your blog a couple weeks ago! As a mom of two I love reading bc your posts are super relatable and real! About a year. Love your blog and all the gorge pics of little E.
I've been reading for a few months now! I love hearing everyone's stories. I am OBSESSED with your blog! I found you from my friend Ashlie at themanyfacesofreagan! I have been following you pretty much ever since I started blogging 2.5 years ago! My favorite part about blogging is being able to look back on the memories we've made as a family and experiencing life with other "mamas" through their words and pictures! So excited about this giveaway!! I have been a follower of your blog for a about 6 months now! I absolutely love blogging, just connecting with others around the world who share similar interests to mine is great! I've been reading your blog dor awhile now. I don't know exactly how long though ;) Our little girls are close in age. I love blogging because it's the easiest way for me to document things about our family, our life, and our little girl. And I like the sense of community that blogging offers. I've been reading, gosh, maybe 1 1/2- 2 years? I've been a following for a longggg time and I love your blog! love love love your blog! i've been following since i saw jamie's [@ this kind of love] link up for valentine's day. my fav part about blogging is how it's kind of a time capsule. i have a blog i did while i was wedding planning, and going back and reading those posts, definitely take me right back to the moment. Congrats on 2000! I love reading your blog :) this is an AWESOME giveaway girl! I've been reading since your beautiful baby girl was just a sweet baby! You are such a great mommy, blogger, and all around girl! I love blogging because it keeps track of our busy lives without much effort! Congratulations on reaching 2,000 followers!! I love your reading your blog!! 2,000+ followers?! That's amazing! I can only hope to get there one day. I've been reading From Mrs To Mama for a couple months now. Love your style, such a great blog. I love blogging. It's been less than a year but I've learned that it's such a great hobby and I have met some amazing women. I'm planning to re-vamp my blog and look forward to the next year in my blogging career :) Good luck with pregnancy number 2! Feels like I've been reading forever, but probably a eighteen months or so?? My favorite part of blogging is the creative outlet, and all of the fabulous women I've 'met!' Thanks, girl!! I've been reading for a few months..I cant pinpoint one thing I love about your blog, all your posts are wonderful! Your blog was one of the first ones I found and started following :) I've been following since January. And I love blogging in general. It's a great way to capture moments in your life and have them written down somewhere & I love talking with the ladies I meet through blogging. Like my own little support system via the computer! I've been following you since you were pregnant with Elliana. My favorite part about blogging is preserving memories. Been reading you for quite some time since our little ones are close in age...and our due dates are only a week apart for this pregnancy, yay!! I have been reading your blog for over a year now and love that your blog is so down to earth about being a working mother/wife and everything else!! and congrats again on the little boy coming to your family! i've been reading for all of ONE day and i had no idea you would be doing a giveaway! fun! i love blogging because it makes me excited to think that my daughter will one day read about her life, from conception to who knows when! I have been following your blog for a couple of months now. I enjoy blogging, because it is a fun hobby, and I love looking back at all the memories we are making as a family. I have been reading your blog for a couple of months, I love it! My favorite thing about blogging is how I feel so connected to something that I never thought was possible. These are my internet friends! I've been following for a long time now, it is definitely one of my must read blogs each day! I love your posts and the time you put into doing it! Love reading your blog! And Love this giveaway! I have been reading for a few months now. I just started blogging myself but love knowing my little girl will be able to read it when she is older. Love reading your blog! What an awesome, awesome give-away! I have been reading your blog for quite some time now! I love it! So excited about your giveaway!! I have been following since your daughter was born! You made me want to start a blog of my own! I've been reading for a year or so now! I love seeing all your great photos. Love reading your blog! Your candidness is awesome! Great giveaway, I am a brand new follower but have read your blog for a while now :-)MY favorite thing is your house transformation and reading about your pregnancies! fun giveaway on your adorable blog! Ive been reading since a long long long time ago! My favorite part when I started was seeing the blue roses on the side bar, now it's just seeing all your pictures! I've been reading for almost a year now! Love your blog because of your honesty and realness! I've only started reading your blog when I saw you started the 411. I think you are so endearing and great! Your blog has truly inspired me! I've been reading your blog for a couple years now and I love meeting people through blogging that I would have never met beforehand. Love your blog and love keeping up with your life! Oh gosh.. I have been a follower for at LEAST 6 months now... and I LOVE blogging because it is an amazing outlet. I have been reading your blog since I started back up blogging, so about three or four months. I love reading about little E and your pregnancy! Plus you wear some of the cutest dresses! I have been reading since you were just pregnant with E!! I love blogging because of all the great ppl I have met and to keep my family in the loop!! I've been reading for about 3 months, I love getting your posts right to my email every day. The blogging community is my fav part about blogging! THANKS for the awesome giveaway! I love blogging because it has connected me to such amazing women, who now are some of my best friends! I've been reading your blog for years now :) I love the relationships that you get to form with people all over the world! I love being able to meet such incredible people and form some forever bonds through blogging. I am a new reader - can't wait to see more! I love the entire blogging community, everyone is so sweet and supportive. I love giveaways and I love your blog! I found you from a friend's blog and have been following ever since! Thanks for sharing your life! I have been reading for about 5 months and my favorite part would probably be that I can write about anything and everything I want and get to share it with so many people. I've been reading since you were pregnant with E. and my favorite part of blogging is how support everyone can be! I'm a new follower! :-) My favorite part of blogging is getting to meet people all over the world and sharing our stories! I have been following your blogs for about a month! My favorite part about blogging is documentung my daughter's milestones. I don't remember exactly when I started reading your blog but it's been a few months! Your daughter is so precious :) I'm still new to blogging myself so I really like learning through other peoples' blogs! What an awesome giveaway! Congrats on 2000 followers. I've been lurking for a couple months and actively following for about a month! I have been reading your blog for a few months...maybe since the beginning of the yearish. I've been reading since around February I think. I love reading about other people's day-to-day life! I do not blog. I always say to myself that I should because I read so many blogs. I love your blog and I feel like I have been reading it forever, but i think it has been a year!!! God bless & Thanks for this awesome giveaway!! I've been reading for a couple of months now:) I think I found you through a giveaway or link-up! And my favorite part is the amazing blogging community and all of the support you find in it. I honestly have no idea how long I've been following? Maybe a couple months? And my fav part about blogging is meeting amazing girls and becoming actual friends with them. Hi!!! Been a reader for a few months now and I love reading yours! I love blogging as a form of documentations and sharing and meeting new people! This is a great giveaway! I have been reading for about a year and love your blog. I love blogging because it is nice to write about life and share your journey with others. Recently reading---but love the community and all the great ideas! I've been reading for a couple of months now & my favorite part of blogging is meeting so many amazing mommies! I've been reading for about 3 months and I love your posts! definitely hearing your mommy stories and seeing pictures of your gorgeous little gal! I don't even know how long I've been reading...it's been THAT long! ;) Probably since I first started reading blogs/blogging over 3 years ago. I LOVE all the friends/moms I've met through blogging. It's the best! I love love love reading your blog and seeing pictures of your beautiful baby girl! I am just getting into blogging and this would be great to have an ad on your page! I have been reading your blog since it was Meet the Stonekings, before you were pregnant! Love Love your blog and all the amazing pics of Miss E! I don't have my own blog.. The love for your family shines through each post you share. Quite lovely to read. So exciting can't wait to see what else is in store for the blog. I've been reading your blog since April...and I started from the beginning :) You inspired me to start blogging! My favorite part is the connections with my bloggy friends--they are awesome. I don't remember when I started reading/following your blog. My favorite part is just reading about your life. I think that it is fun to read about others. I have been reading your blog for at least a year now I think! I'd have to say my favorite part about blogging is getting a nice comment here and there from other bloggers who understand exactly what you're talking about. It's a great community! I found you on IG and started following a few months ago. Love it :) My favorite thing about blogging? Looking back on older posts of when my girls were younger. I've been following for over 2 years! :) Possibly longer! I can't remember exactly! I've been a follower for a year and I love blogging because it is a virtual scrapbook that I plan to print eventually just like you did! I've been reading your blog for a LONG time---I think you were almost finished with your first pregnancy! I love blogging because I "meet" so many awesome people who I would never "meet" if I didn't blog! Hey Chick! So you know I've been reading since way be Ellianna : ) It has been AWESOME to watch your little family grow! My favorite part about blogging (other than documenting our lives of course) is being inspired by SO many other women! Which includes you, my dear : ) I am convinced you are superwoman! Obviously, "be" should be "before" on my last comment.. Oops. I have been following you since E was a couple months old! gggeezz...girl - talk about a crazy awesome giveaway!!! thanks so much for blogging...i love reading along about your adorable family and everything you have going on!!! I've been reading since before baby number two was in board! My favorite part about blogging is the friendships with complete strangers and the support from followers. I've been reading your blog for around 6 months or so. I love that I have a digital way of downloading all of our family memories!! Found your blog about a month ago and I LOVE it! Love your blog!! Found you through Perfectly Imperfect. Thanks for hosting such a great giveaway. For probably about 6-7 months. I just love all of your pictures & your adorable little girl! I love blogging because it's such a great community of women! oh, and i've been reading for about 6 months & my favorite part of blogging is definitely the friendships! Oh my goodness, I have been reading for years now... I still remember giving you one of those silly blog awards years ago and you were all excited and your hubs thought this blogging thing was crazy. I couldn't get over how stinking gorgeous you two were an how perfect your wedding pictures were. Doesn't that seem forever ago?!? I've been reading for a while but started following once our family started a blog after we had our first baby in April. It's so nice to know other people are going through the same things :) I love reading about your precious family. I've only been following for a few months. I love blogging because of the community - I've met some of my blogger friends in person! Reading other blogs also gives me so much confidence! I get the courage to try new things I would normally never try! The blogging community is so supportive. Love this giveaway! Been a follower for about 6 months or so :) Best part of blogging is meeting new people! ive been a follower since my pregnancy! Over a year i think :) i love reading everybodys stories, and getting to know them. The blogging world is pretty amazing! I've been reading for a couple of months. My favorite part of blogging is getting to know people. I just found your blog not to long ago...but love that you actually blog about family..your not all about ads and reviews..i feel like i actually get a sense of your family and your children will LOVE this blog one day when they grow up!! That is my love for blogging...to record memories that one day my daughter can read and know what life was like. I've been reading your blog for about 8 months. My favorite part about blogging is sharing my experiences with others in hopes of helping them, and the amazing people I've met because of it! I've been reading for a few months now. :). I love how positive you are and as a fellow pregnant person, I love bump updates. I've been following you for a little over 2 months. I love your pregnancy updates! My favorite part about blogging is interacting with other bloggers and meeting new people! I love reading your blog have been following for almost two years now! I told both of my sisters about your blog and the read and follow along too. I love your blog, I have been following for about five or six months and you are one of my favorites to read. You inspire me to be a better stay-at-home mama and wife =) and your little girl is just a doll. I'm so excited for you to have a little boy too! My son is 9 months now and let me just say, boys are so fun. Really really. My favorite part about blogging is honestly creating a memory log of events for my family. My memory is terrible and I want to be able to look back one day and share our stories with my children and grandchildren. It's also great for all our family who don't live close to us so they can stay in the loop. And! I also love being inspired by all the awesome ladies out there who share their stories and ideas with us. I've been a follower for a number of months now (not sure exactly how many) but I love the blog! And my favorite thing about blogging is meeting so many wonderful people that I wouldn't have otherwise. I've only been following for a few months - found your blog through a friend! My favorite part about blogging is all of the friends I've met/made...not just near where I live, all over the country and world! I've been lucky enough to meet a few in person, which is even better! Ive been reading for about a year now :) I found you when I was pregnant with Troy so I could share the excitement with someone about momma hood! My favorite part about blogging is finding hilarious chicks and reading about their lives. I love that we can all share the differences in our lives like some are single, married, divorced, etc. and we all connect in some way. I'm pretty new to blogging, I don't have much time as I'm in Nursing school. Last semester thank goodness. I love your blog you have great ideas, take great photos, and make me can't wait to have children. Obviously my hubby and I are waiting until after nursing school is over with! Thanks for sharing your story with us! I literally just stumbled upon your blog via Britt at the Magnolia Pair...and I'm loving it so far! I adore blogging because it allows me a way to not only document my home inspiration, but to get inspiration from others as well. I have been reading your blog since my son was born last November- I love reading about your sweet family! Congrats on #2! Hey there, I have been following your blog for around 7 months and love that are babies are about a month apart. I can totally relate to so much of what you post! I love your blog because its gives a lot of insight on young families. I'm about to get married and have found myself devouring any blog related to mommies and wives. I blog to keep our family updated on our lives in Kenya! Love your blog, been reading it for a couple months. You've inspired me to start a blog, the site is up, just need to start blogging lol congrats on ur beautiful and growing family! Becky! I've been reading your blog since we BOTH were pregnant. I think we're meant to be best friends...<3 maybe I 'm just wishing. Congrats! I was a silent blog follower for a long time and your was THE first blog I started silently following. Naturally when I finally started my blog not to long ago, I made it official. Congrats girl! You and your family are beautiful and an inspiration to many, including me. I've been a reader for over a year or so and I remember when you hadn't even hit 1,000 followers yet. Look how much your little blog has grown!! So excited for you and what's to come in blogland and in your adorable life! I've been reading since you found out you were pregnant with Elli. It's amazing how much it's grown, love following your story & how honest you are in all your posts! I have been reading you for over a year now. I used to follow you when I blogged under my old blog Me to We Est. 2011. My fav part of blogging is the community and the friendships we all form together. I've been reading for a while now -it's fun and we're going through a very similar time together :) I have a 14 month old daughter and I'm 18 1/2 weeks preggo :) I have been blogging since finding out I was pregnant with my daughter in October 2010 -- I love it. I've been following for about nine months now -- I was 6 months pregnant with my first daughter and loved seeing the photos of you & yours. You also got me into thinking how wonderful it would be to go back to school to become a nurse. Something I had been thinking about for a while -- thanks! I don't know the exact time I've been reading...maybe 6-8 months? But, I've never regretted following. Love your realness, stories about your family, and just everyday life! I just started reading today. You blog was recommended to me, and I've been looking for some reading recommendations! I have been reading your blog for about five months and it has become a daily ready of mine. I truely enjoy your thoughts, ideas, suggestions and your take on life. I especially love when you let us know about good deals. Thanks for your writing! I love how supportive and helpful everyone in the blogging community has been. I also love just having a creative outlet- no matter if someone reads it or not- I'm able to put my thoughts into words/pictures. I've been reading since Miss E was about 5 months I've loved watching your family grow and learning mommy tips that I can now use myself! Enjoy reading your blog and watching your belly grow! Oh My. I think I started reading your blog when I got pregnant, maybe 2 years ago or so. My favorite part about blogging has been the support from the women who are going through the same things! Ive been following your blog for about a year now. I love reading about all the fun things you guys do. I started my blog mostly for myself and family members that cant see the kids all the time. I really need to keep up with mine more, but Im always busy playing with my little ones. My favorite part of blogging is that I can look back on all the memories and I have already made so many bloggy friends. I love the blogging world. I adore your blog! Ive been a follower for only a few months but I always make time to visit your page no matter how busy I am with my little girl. My favorite part about blogging is being able to turn it into a book for my daughter to keep forever!